Published in the U Matuna, the newspaper for the Archdiocese of Hagatna, Guam, on 12/09/12. It’s my favorite for a couple of reasons. First, it appears to be the only name Mary gives herself (the rest being titles given her by us). And second, it tells us who Mary quintessentially is: “she who crushes the stone serpent”. According to a 17th century account, while the Virgin was appearing to St. Juan Diego, instructing him to fill his tilma with flowers and present it to the bishop, she was also appearing several miles away to Diego’s uncle, Juan Bernardino, who lay sick with a deadly fever. Having cured Bernardino, the Virgin instructed him to present himself to the bishop and recount the manner of his cure. She also directed that she should be named “Cenquizca Ichpochtzintli Santa María de Guadalupe” (The Ever-Virgin, Holy Mary of Guadalupe). At least that’s what the Spanish Franciscan, Juan Zumarraga, thought he heard from Bernardino, who spoke Nahautl, the Aztec tongue. At the time (1531), Guadalupe, a village in Spain, was the site of a well-known Marian shrine and was known to Zumarraga. Some speculate that the Virgin may have allowed Zumarraga to hear the familiar “de Guadalupe” in place of the phonetically similar “Te Coatlaxopeuh” in order that her appearance be given immediate credence, which it was. By 1666, some began to question the “de Guadalupe” part of the title, but it would not be until 1895 before an intensive study finally concluded that what Bernardino had said was not “de Guadalupe”, but “Te Coatlaxopeuh”. It’s tempting to speculate that the Virgin intended the confusion. While “de Guadalupe” facilitated the acceptance of her appearance by the Spanish clergy and invigorated their Mexican apostolate, “Te Coatlaxopeuh”, (she who crushes the stone serpent) as the Aztecs heard it, was apocalyptic, and had immediate import. For the Aztecs, the “stone serpent”, was monstrously real. 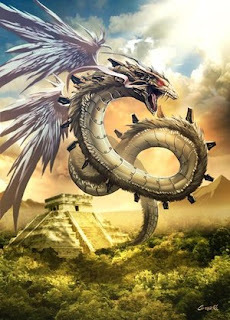 He was “Quetzalcoatl the Devourer”, the Aztec god who feasted regularly upon still-beating hearts torn from the chests of tens of thousands of living human beings by Aztec priests. And crush him, she did. Within a few years of her appearance, over eight million mexicans converted to Christianity, the largest single conversion event in history; and Quetzalcoatl was no more. The passage is a fantastic depiction of the final victory of heaven over hell, and it is an image that has been repeated countless times in every possible art form: Mary standing on the world with Satan crushed beneath her feet. It is an image that holds in it the promise of our salvation and which has drawn two millennia of her children to “flee to her protection, implore her help, and seek her intercession” in our personal battles against the gates of hell. Protestants have never been comfortable with this image and their bibles have long since retranslated Genesis 3:15 to read “he will crush (or bruise)” rather than “she”. Of course, the “he” is Jesus, and, for Catholics, the primary role of Jesus has never been in doubt. But the Catholic Church has always held that Mary’s role in salvation was much more than just a bodily conduit for the Savior, which is why we have dogmatically protected her with titles such as “Mother of God”, “Immaculate Conception”, and “Perpetual Virgin”. But again, those are titles we have given her, and “Te Coatlaxopeuh” is what she has given herself. It can even be said that the Church sealed this title in proclaiming the Immaculate Conception wherein the “she will crush thy head” of Genesis 3:15 plays a central role in the definition of the dogma. However, modern Catholic bible translations no longer say “she will crush thy head”, but, like protestant bibles, now say “he”; and Mary is relegated to a tamer role. There are scholarly explanations for the change. But meanwhile, in the scriptural absence of Mary as “serpent crusher”, Quetzalcoatl the Devourer has ravenously returned. And whereas he once feasted on thousands of human hearts ripped from living chests, he now devours millions of living infants ripped from warm wombs, and drinks to intoxication the rivers of blood which flow from our abortuaries and the other altars of slaughter erected in homage to the gods of the Culture of Death.